Einstein is often credited with the quote, but verification in the form of evidence is slim. Whether he said it first or not, it’s a good point. 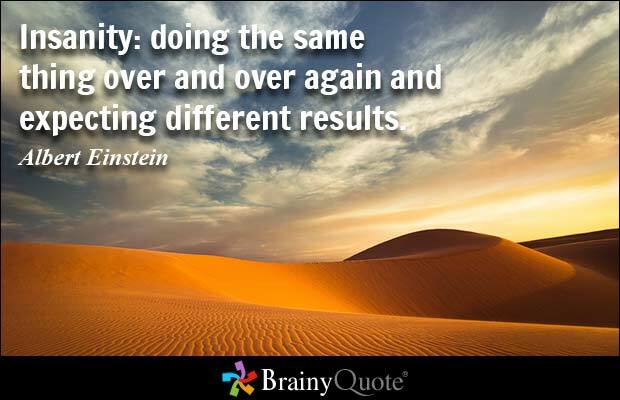 Doing the same thing over and over and expecting different results isn’t logical. If the progressive leaders keep relying on outdated methods such as phone banks, we’re unlikely to regain the White House. Even the midterm elections in the Senate and House will be weaker if phone banking is the main tactic. My point is this: keep training focused on messaging. Phone calls are not the most efficient way to reach voters any more, so we progressives need to find other ways to get our statements heard. With the training focused on spreading our message concisely and clearly, we can then move on to finding ways to get that message heard. That said, I think I’ll make sure my caller ID is working. I might even reset the voice mail to kick in after two or three rings instead of its current five. This entry was posted in all politics is local and tagged it's the economy, Voter's Voice by Daisy. Bookmark the permalink.